Officials of the FCT Administration have apprehended six persons for engaging in act of graffiti on the walls of public buildings and infrastructure around the Federal Capital City, Abuja. The six persons apprehended were caught in the act and would be made to face the full wrath of the law because the Administration would not allow the defacing of the Federal Capital City. It must be noted that Abuja remains the window through which the world sees Nigeria and therefore, must be maintained with high sense of commitment and responsibility. 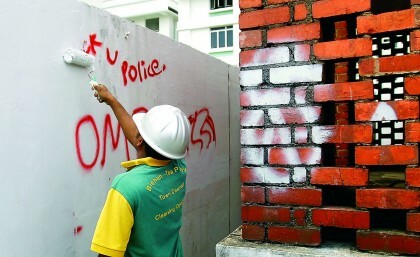 The Administration warns that security agents are now maintaining 24-hour surveillance to ensure that those engaging in the act of graffiti and the likes are promptly apprehended. It may be recalled that the FCT Administration had recently embarked on massive clean up of such writings to give the city a face-lift. The Chief Security Officer to the FCT Minister, Deputy Superintendent of Police, Ahmed Rasheed revealed that the apprehended suspects are now with the security agents and would soon be made to face the full wrath of the law.